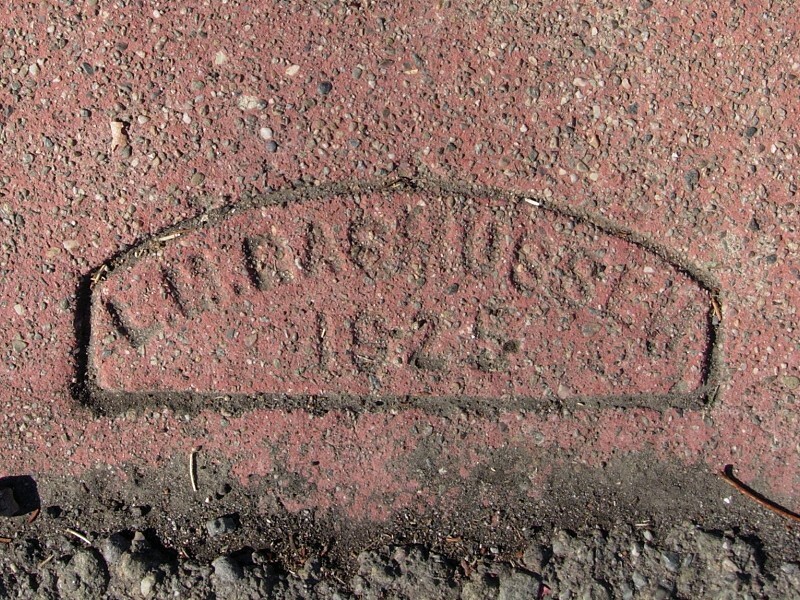 A sidewalk stamp is a proclamation of the maker’s skill, an inscription literally made in (artificial) stone. But as every copy editor knows, mistakes can escape the most stringent quality checks. I’ve found misspellings on the very spine of a book. 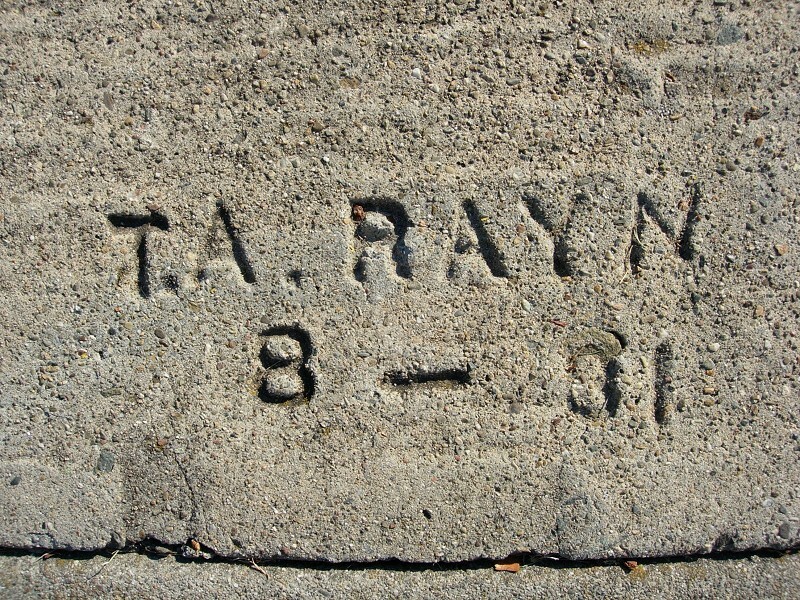 Here are some I’ve found on Oakland’s sidewalks. 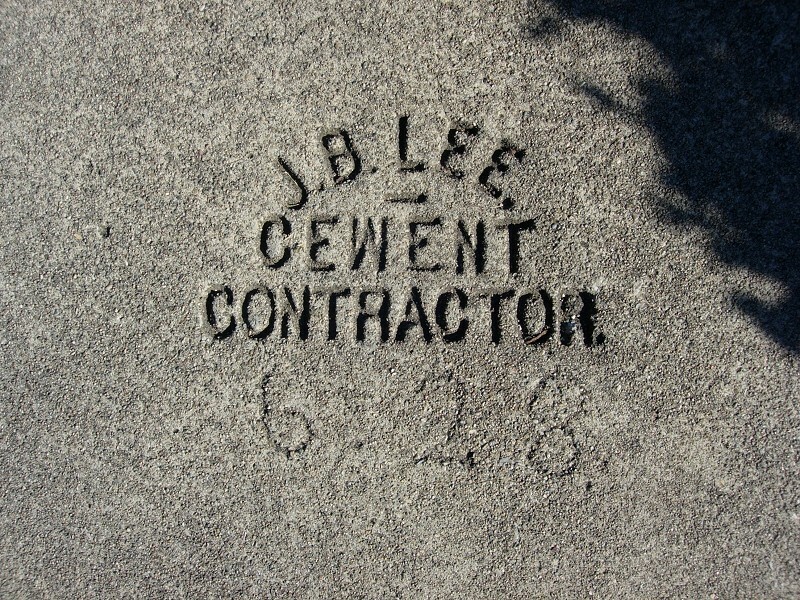 Some concrete workers set their marks a letter at a time. 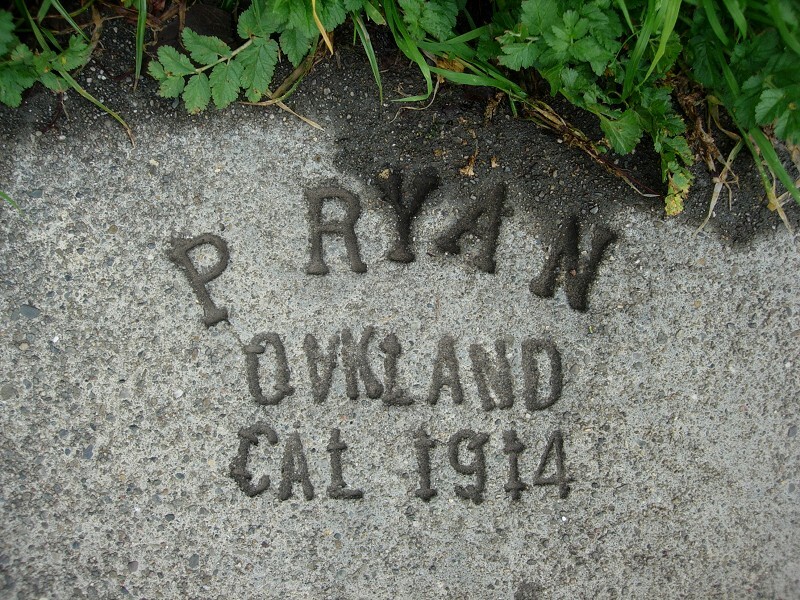 I know this from the errors they made, like this one by T. A. Ryan. 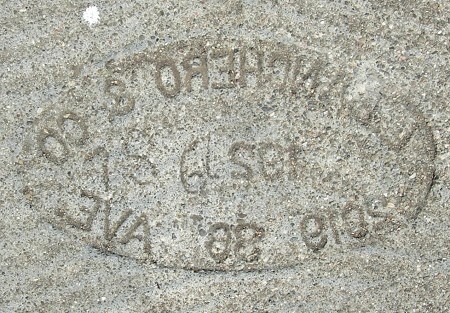 Or this anonymous mark by the fire station on Martin Luther King at 17th Street. 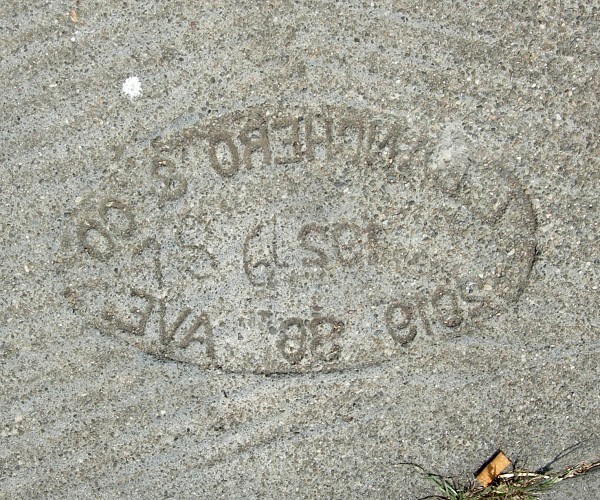 More typically, a concrete contractor would have a stamp cast in bronze; see Louis Lambretti’s original stamp over on the Sidewalk Secrets blog. Having a stamp made was an important business decision that must have been a pricey deal, one that involved appointments with a metalsmith to settle on the design and text. I assume that if the contractor or the fabricator was fooled by the reversed text, the stamp sometimes came back from the foundry with a harmless mistake. 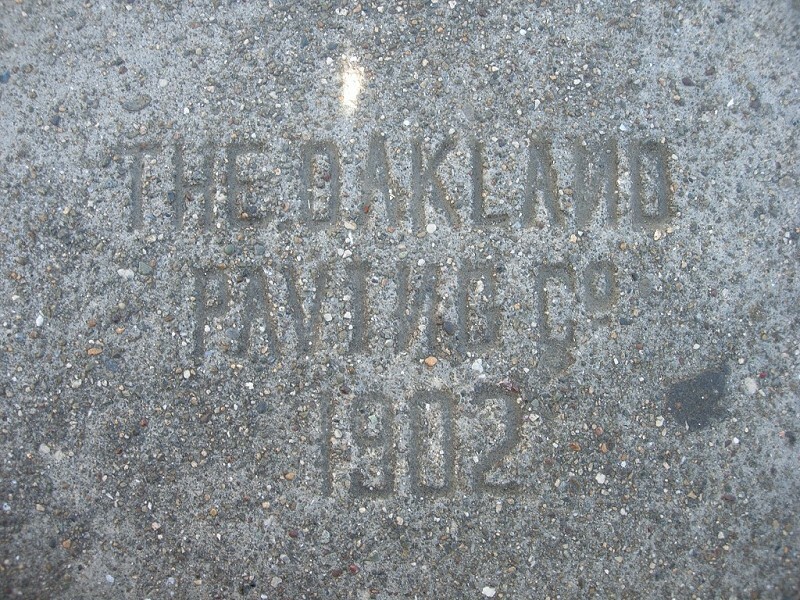 The earliest example I have is the pair of reversed letters on the Oakland Paving Company’s first stamp. Patrick Ryan put up with this particularly sloppy stamp that included an inverted “A”. Laurits Rasmussen never did have the reversed “N” on his stamp fixed, but it’s rarely even visible. The error in James B. Lee’s stamp was more glaring, but he kept using it. And it didn’t seem to bother A. Rodrigues that his city was spelled wrong. But Lazzero Banchero had no choice but to reject his fabricator’s cockup. It’s conceivable that he didn’t notice until the first job he tried to stamp. 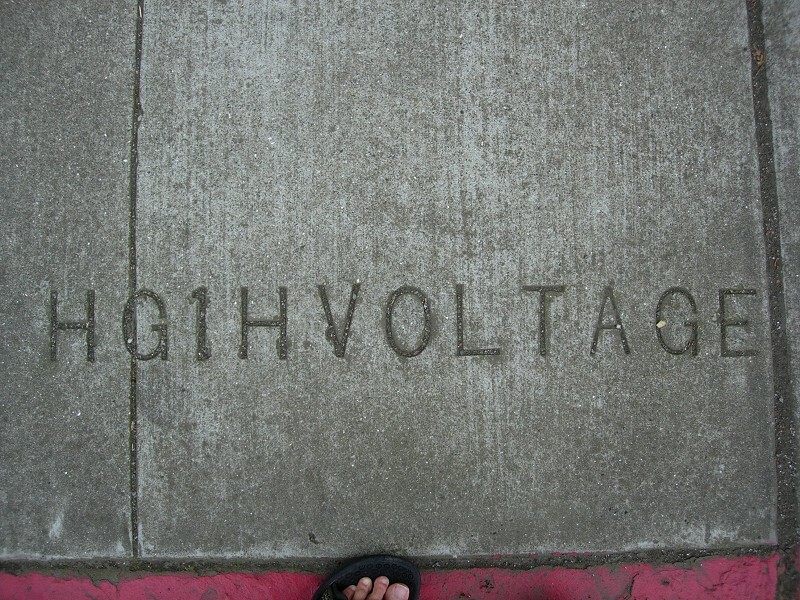 All I know is that there’s only this one example in Oakland. Some people just have trouble seeing letters. In earlier times we used to call them slow or stupid. As we all know today, you can be dyslexic and still be smart and successful, doing jobs like metalsmithing and concrete finishing that usually let you finesse your weakness. But you do have to take extra care to get things right. And if there are two dyslexics in the chain of fabrication, all bets are off. Fortunately, today stamps are made cheaply of silicone rubber, and concrete is very predictable allowing mistakes to be troweled over. Both factors have made errors very rare . 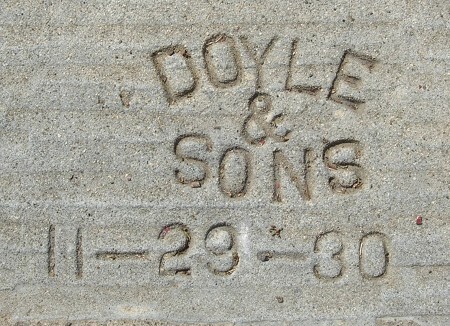 . .
Just a few weeks after putting down the mark I showed yesterday, Doyle (or one of his sons) made this one, using a different configuration for the date and somehow getting both the “D” and the “8” upside down. 1926 – L. Banchero & Co. 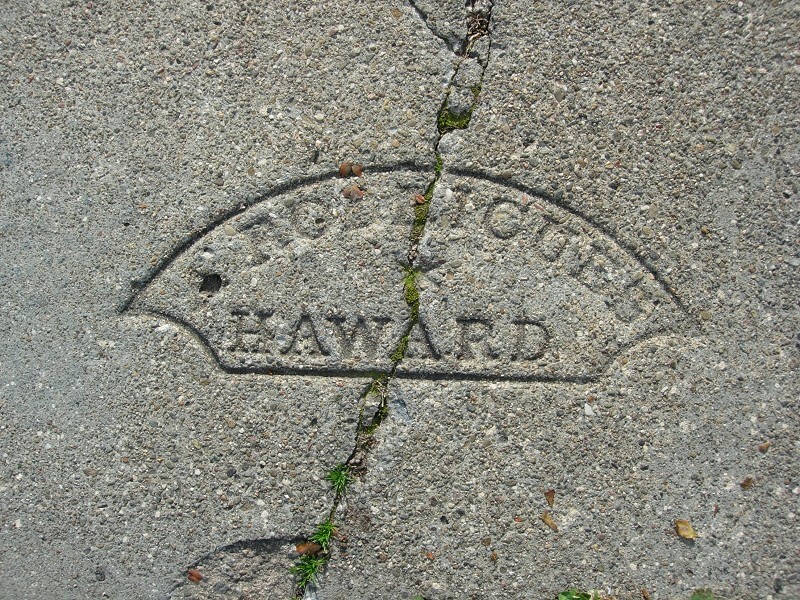 This bizarre backwards mark appears to be from 1926. Let me share my thinking here. First, we’re very close to Banchero & Co.’s home location on 86th Avenue. Second, all my other Banchero marks used a racetrack format whereas this is an oval. Third, unless I’m badly mistaken, there’s no possible way to create a reversed mark with a properly made bronze stamp. Fourth, the numeral 6 next to the (backwards) date “192_” suggests to me that it’s meant as 1926. 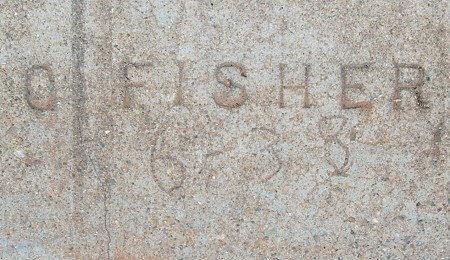 Fifth, all other Banchero marks date from 1927 and later. 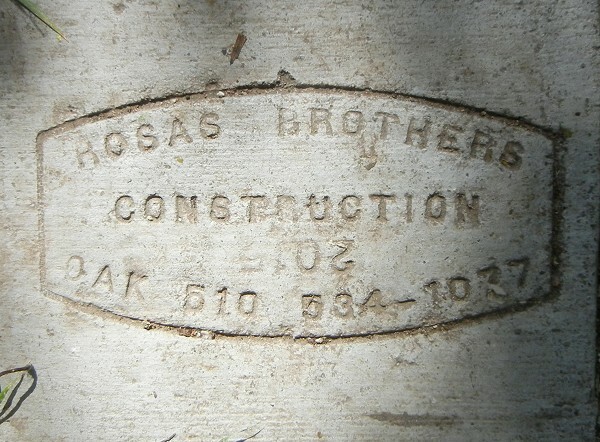 The scenario I envision is this: When it went into business in 1926, the Banchero & Co. firm ordered a stamp, but it was defective thanks to a boneheaded foundry error. They went ahead and used it until a new one was made. I’ll have my eye closely peeled as I explore the next few avenues. 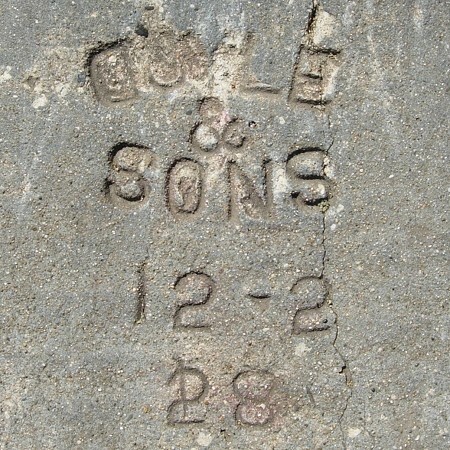 Notice that the S’s are upside down, and also that the second character of “Sons” is a zero, not an oh. C. Fischer does it again—a second misspelling from this year. 1917 – C. Hubmann & Co. This is a new maker for me. Notice that the V in “Fruitvale” is upside-down.